on the 22nd to the 25th of January. from the Province of Mexico (MEX). We prepared a booth where we welcomed youth and shared with them who we are and where we are in mission. We believe that our charism and internationality are gifts, and these are very attractive to youth; we were happy to share these with them! The Earth/Love logo (which had our Open Heart logo as the letter “O”) and the image of the Open Heart surrounded by the countries where RSCJ serve were the main images with which we decorated our booth. We also put up many pictures of RSCJ in community and mission around the globe. We shared pamphlets, postcards, pens, magnets and pins -- all with our logos. We invited youth to “Put your prayer in the Heart of Jesus” by writing an intention and placing it in a large heart in front of our booth. We now have many bags of intentions to pray for! But by far what the youth found most attractive in our booth was the Sacred Heart "tattoo." Each day the lines of young pilgrims grew longer, as they came to get ‘tattooed’ or marked with the Heart of Jesus. 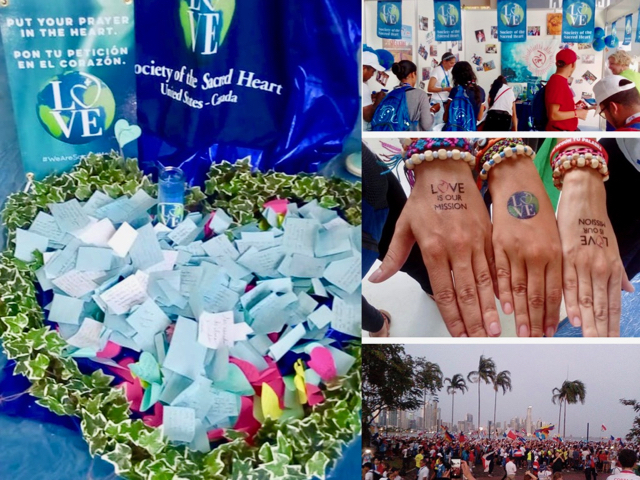 This, and the many thousands who stopped to put intentions in the Heart, gave us a wonderful opportunity to talk with them about the Open Heart of Jesus and remind them that “Love is Our Mission” is not just for RSCJ, but for all believers. We also engaged them with the question, “Where are you from?” When they found their country on the large banner, they were very moved. If they didn’t find their country on our Open Heart banner, they asked, “Why are you not there?” (especially the Panamanians) and we continued the dialogue. If they seemed interested, we offered to take their contact details and invited them to “Stay Connected to the Heart,” to find out about volunteer possibilities, or find out more about the Society, or to consider a vocation as a religious. 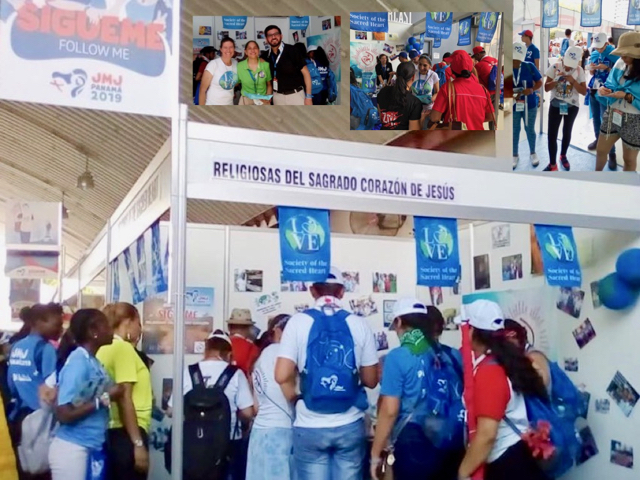 Being at the Fair every day, engaging and talking with thousands of youth (over 700,000 youth were at WYD), drew us into the spirit of joy and hope filling their lives. It was so moving to meet young men and women who already knew RSCJ or resonated strongly with our charism, or simply came from countries where RSCJ are or were (like Nicaragua). There was no lack of photos, songs, memories of RSCJ or our institutions, little gifts… always shared with love. One young person, with tear-filled eyes, explained how an RSCJ in Cuba had marked his life forever. The many youth and older adults from Venezuela begged for prayers for their people. These four days of sharing with thousands of young people who visited us in the Vocation Fair ensure that many now know us and others have left with hope that one day their country will appear in the RSCJ country logo. This vocation ministry opportunity grew into a strong experience of mission: loving young people and discovering and manifesting the Love of the Heart of Jesus together. We ended this experience feeling joyful and deeply motivated. 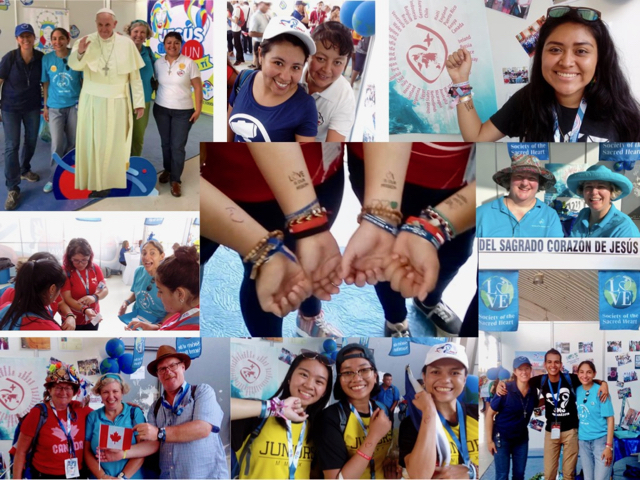 We thank the many donors who made our presence at World Youth Day possible and the International Vocation Commission for their support in strengthening the bonds among our Provinces and our living as One Body, discovering and manifesting the Love of the Heart of Jesus together with youth!